Yet what was going on that day was anything but routine or ordinary. The cavernous Council Chambers, high up on the tenth floor of San Diego’s City Hall, was swamped with people wearing blue T-shirts emblazoned with large white letters saying: “Keep the OBcean attitude.” This visual statement to elected officials of the breadth of support for the community plan was worn by Ocean Beach residents, property owners, merchants and supporters. Leaders from every neighborhood organization in Ocean Beach had mobilized their respective memberships. The Town Council leaders were there, as were the local Friends of the Library, the OB historical society, other merchant leaders—they were all there. Community activists had mobilized dozens more through a petition drive in support of the plan—and signatures of thousands of residents, visitors and supporters had been collected. What was happening that day was a showdown between a feisty, funky, working-class neighborhood and the San Diego establishment—a showdown over a blueprint for urban development—a community plan nearly four decades old, forged in the strong ecology-oriented, anti-development and populist grassroots activism of the 1970s. The “update process” by the City planning department had resulted in an official new planning document—the issue before the City Council. Looking out over the “sea of blue” that afternoon in the bowels of City Hall was a scene that was very reminiscent of a scenario involving the exact same community, the same Council Chambers, and the exact same issue—the community plan—exactly 39 years earlier. It was the spring of 1975, when OB residents, property owners and merchants had mobilized in support of their new community plan. Then—as in 2014—the rebellious neighborhood of Ocean Beach faced off with the city’s establishment and bureaucracy over the community’s direction. The parallels would be eerily pleasing to those who had witnessed both scenes—but alas, no one had, except for this writer. excitement. Standing opposed to the plan, a handful of small property owners and their supporters were challenging some of OB’s historic restrictions on development. This small caucus, however, was not the only opponent in the Chambers that day facing off with the “sea of blue.” Even though its presence couldn’t be physically seen, its influence clearly was. The unseen entity was the powerful San Diego Planning Commission. A month before the City Council hearing, the Planning Commission had reviewed the Ocean Beach Plan, the last stop for the Plan before Council. This panel of prestigious mayoral appointees represented San Diego’s establishment more than any other body in the City’s wardrobe of quasi-government committees, boards and agencies. Often these plum positions were rewarded to favorites by a revolving door of chief executives. In the minutes before the Planning Commission took their vote, many of the Commissioners praised the “uniqueness” of Ocean Beach, the community’s funkiness and rich history. Then as a body they turned 180 degrees and voted to eliminate the very tools the community has used over the decades to ensure that uniqueness. The Planning Board in Ocean Beach has utilized certain mechanisms for years to limit over-development with city approval. This mechanism has allowed OB to be a haven from the three-storied behemoths that wall off the coast in other beach neighborhoods. Specifically, the Commissioners wanted to remove any references in the Plan to what’s called the “FAR”—the floor-area ratio. The FAR represents the ratio of how much floor space is allowed in new housing structures in relation to the overall lot size. 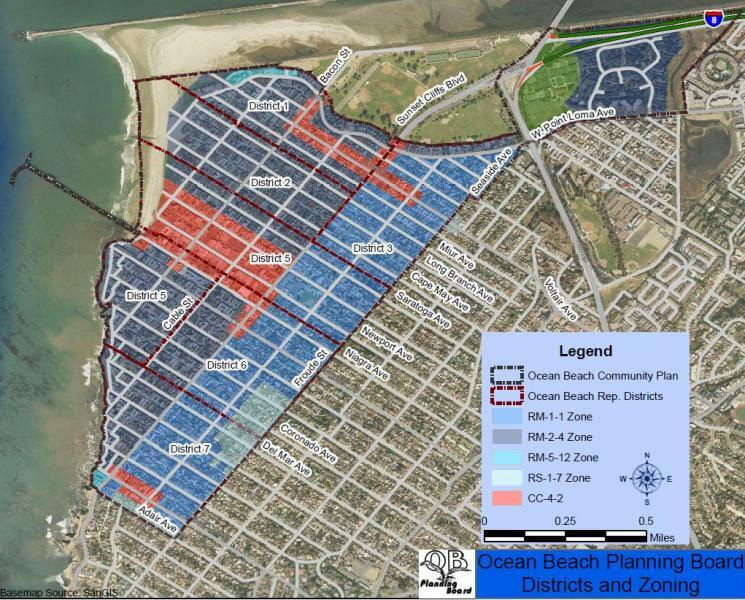 Most of Ocean Beach—and particularly its coast—has a FAR of 0.7. This means a developer can only construct a building whose total floor space is 70% of the square footage of the whole lot. This relatively low FAR for OB has in most part prevented the construction of large single-family homes along the beach or other coastal stretches of the community. In contrast, most of San Diego has a FAR of 1.0 or more. Partially because of this, many coastal neighborhoods within San Diego and other towns along the coast have been inundated with the three-story structures, with massive footprints. Still, OB remains one of the city’s densest neighborhoods even with a low FAR. When the Commissioners’ vote came down, many of the leaders of the Ocean Beach organizations who had attended the hearing were shocked. An urgent meeting was held by activists back in OB to map out a strategy to counter the Planning Commission’s ploy to gut the FAR. They knew a showdown approached at the upcoming City Council hearing and they needed something to mobilize the community. What they came up with was a time-honored tactic of grassroots activists, a petition—which volunteers could circulate around OB, at farmers markets and at key stores—which would explicitly counter the Planning Commission recommendations. As activists and Plan supporters worked out the language for their petition, the scene too was very reminiscent of what happened nearly 40 years earlier, when local OB residents began to write up and circulate petitions about the Plan. It was 1975 and the earlier petition called for the democratic election of the community planning committee, something not included in the city’s scheme. Clearly, then, this wasn’t the first time the community of Ocean Beach had to face off with the San Diego establishment over planning issues. Today OB is described by city planners as the model “urban village within a city,” a very “walk-able” small community one mile square. Sitting seven miles to the northwest of downtown San Diego, it’s wedged into the sandy corner of the hilly Point Loma Peninsula, with about 15,000 residents—six of every seven of whom rent. Ocean Beach, in the late 1960s and early 1970s, found itself like much of the rest of coastal Southern California experiencing higher density and congestion—the ugly consequences of decades-long unbridled apartment construction. The construction frenzy that engulfed residents at the coast was at the end of a chapter of the modern era of urban development in San Diego, and the curtain was closing on the stage that had been set by economic forces unleashed right after World War II. OB has always been one of the more working-class coastal neighborhoods of San Diego, with its beginnings as a cheap beach resort. OB’s small, narrow bungalows—once considered seasonal structures—provided the bedrock for the housing demands of aircraft workers and military families during World War II. Once the war was over, and capital freed up, the building spree hit its zenith in the Fifties and Sixties, the virtual heyday of the San Diego building industry. It was the boom time for apartment construction across the city and especially at the coast. For instance from 1967 to 1973 in the city of San Diego, only 31 single-family houses were constructed, while during the same period developers constructed 1,610 multi-family units. In Ocean Beach apartment construction was going full tilt as developers installed two, three and even four-story boxes with as little landscaping and parking as possible. In the process they tore down many old beach “shacks” that provided low-income housing, and squeezed their new tenants—often young and college-oriented—into every available inch of space on their lots. The apartment builders were able to do this because at that time, there was no community plan, no 30-foot height limit, no FAR, and hardly any restrictions. It’s no secret that during this period, developers, contractors and the captains of the building industry owned San Diego and its politicians. The effects of this unbridled construction were deeply felt by the community, a small working-class beach town, one of the very last coastal neighborhoods where the poor, young and retired could still live. In OB, the population swelled with all the new apartments; less parking was available because of curb cuts by developers; due to the lack of mass transit most residents still had to go to work or school outside OB, which made traffic tighter and less manageable. Concurrent with the density increase and congestion, there were strains on the old infrastructure and land, as roads, streets, bridges, the ancient sewer and water systems were challenged daily. The recreation center and library, already inadequate, were strained over their limits. The old public schools were so crammed they had to bring in mobile classrooms. Significantly, access to the beaches and cliffs by the public, both in terms of physical ability and visually, was being restricted by the new construction. With no height or setback restrictions, people’s ability to reach or even see the Pacific Ocean became a huge issue, as fences, walls and large structures blocked from the public use a natural resource held in trust for all. With the quality of life diminishing in Ocean Beach by the early Seventies, OB came face to face with this crisis—a crisis in urban planning, of identification and character of the community, and ultimately, a crisis in democracy. Quality of life issues became paramount to denizens at the coast. Even the local establishment knew something had to be done about the haphazard and chaotic building bonanza. And into the breach stepped the Peninsula Chamber of Commerce, an ally of downtown old money, a business-oriented group that formed a non-profit called Peninsulans, Inc., or simply Pen, Inc. 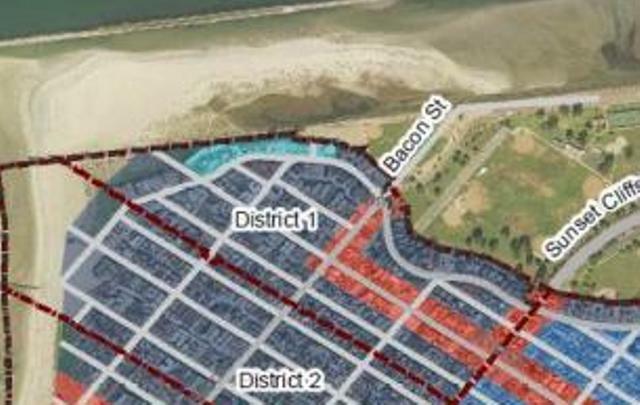 Designated by the city to act as the “citizen’s committee,” Pen, Inc. had the exclusive authority to work with the city planning department to map out an urban design plan for the development of the entire Peninsula—including Ocean Beach. 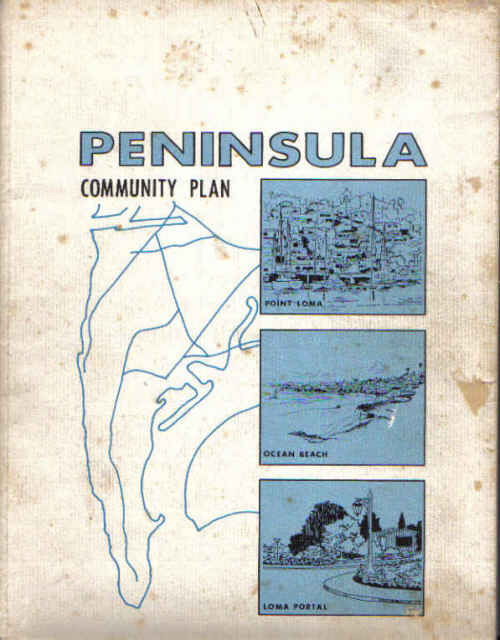 By 1968, the Peninsula Community Plan was the product of this marriage of the Point Loma elite and planning bureaucrats. Pen. Inc.’s vision of OB’s waterfront. But who was Pen, Inc., exactly? Generally, it was an exclusive club made up of large property and business owners, apartment developers, contractors, real estate and insurance professionals, lawyers, and bank officials. They had breakfast meetings every two weeks at 7:30 a.m., and required membership fees to join. Most of the original thirty members of Pen, Inc. would not be recognized today, yet they included people of influence; Pen, Inc.’s chairwoman was appointed to the San Diego Planning Commission; its own lawyer was appointed as a judge to the Superior Court; its ranks listed a major restaurateur—who owned the Bali Hai on Shelter Island; the local owner of a series of family-named large markets; prominent realtors and developers who owned large apartment buildings in OB. It also included a vocal leader of a militant “born again” group called the Campus Crusade for Christ, who owned income-producing property at the beach. It was a sub-committee of Pen, Inc. that drew up the specific plans for Ocean Beach. 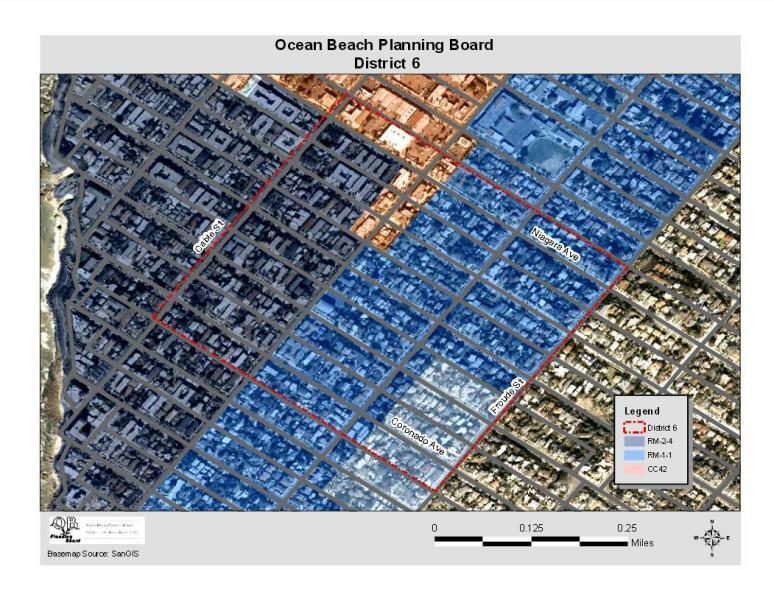 The finalized document vetted by city planning staff was called the “Ocean Beach Precise Plan.” It was truly a blueprint for development written by the local blueblood. Of the 15 members of this sub-committee, only three actually lived in OB. The vast majority did own property in OB and, in fact, three-fourths of them or their spouses owned income-producing property in the seaside village. All of them would benefit by their land and properties becoming more valuable if their blueprint was implemented. 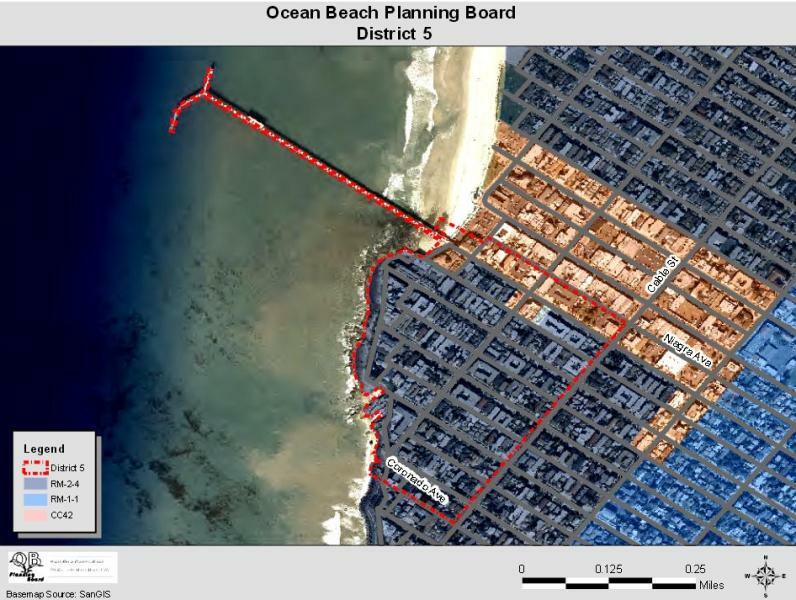 Just what did the Ocean Beach Precise Plan call for? Central to the Plan was a brazen design that called for the demolition of cheap rentals throughout the entire northwestern portion of the community, an area that included more than six residential blocks, all to be redeveloped as a glitzy, tourist-oriented waterfront with nightclubs and hotels. High-rises were just dandy for the cliffs and rest of the coast; green lights were on for four- to five-story apartments; a marina was pictured, dredged out of OB’s waterfront; a 35% population increase was projected; it called for a paved road to be developed through a local regional park at Robb Field; it favored one-way streets crisscrossing OB, and the creation of a mall for the main commercial area of OB. When the Precise Plan was released to the public during the summer of 1971, local residents were horrified and outraged. Clearly these plans—if implemented—would drastically alter the neighborhood, changing its character from a low-income working-class beach town to a high-end beach resort for the wealthy and affluent, favoring tourists over residents. The word wasn’t tossed around in those days, but this was a clear case of gentrification—urban renewal where residents displaced by the demolition of the old housing cannot afford the new housing. The release of this urban development plan—the Ocean Beach Precise Plan—to the community represented the opening salvo in a long, drawn-out battle between Ocean Beach and the San Diego establishment, a half-decade of power plays by the city’s political leadership and planning bureaucracy against the residents of this small working-class neighborhood. Yet with each power move by the city, there would be a counter-move and push-back from the community. And it would be well into the mid-1970s before OB had a development plan that satisfied most of the different elements of the village, and before it had a democratically-elected planning committee to enforce it. For the first time in modern OB history, a community town-hall meeting was held in August of 1971 to get the word out about the Precise Plan and about Pen, Inc. It was organized by activists from three main groups, a militant environmental group called OB Ecology Action—that had successfully led a fight against the construction of a jetty by the City and Army Corp of Engineers the previous summer—the OB Rag—a feisty alternative newspaper run by anti-war leftists—and third, the Save OB Committee—a network of civic and counter-culture activists. The resistance that formed to the establishment plan didn’t emerge from a vacuum. Since the early Sixties, OB had been a strange mix of college students, retirees, surfers, sailors, ecologists, beatniks and artists. By the late-1960s it had morphed into San Diego’s Haight-Ashbury, akin to the San Francisco center of hippiedom. Ocean Beach has always been a mostly Anglo neighborhood, reflecting the fact that it is part and parcel of San Diego—a city that historians have considered one of the most racially-segregated in the American West during the 20th century. OB’s bohemian enclave sat alongside the cramped and transient “student ghetto” that sections of OB had become, off-campus housing for the numerous and nearby colleges and universities. There had been serious signs of youthful dissatisfaction with the status quo in OB. The police-versus-youth skirmishes of Easter Day and Labor Day 1968, the week-long Jetty Battle of the summer of 1970, and the full-scale Collier Park riot in late March 1971, which had begun as an anti-Vietnam war rally and march. It was no coincidence that many OB residents were against the Vietnam war, raging at the time, and many leaders of San Diego’s anti-war movement lived in OB. With the youthful energy of the counter-culture and anti-establishment politics, grassroots activism was in the air. Opposition to the establishment’s plan formalized in the late summer of 1971 with the formation of a coalition called the OB Planning Organization. Its main function was to formulate a populist mandate to resist the Pen, Inc. plan, and it did this by taking a survey of the neighborhood’s residents. A dedicated core of a dozen volunteers began the polling, going door to door in the flatlands, and up and down the hills throughout OB and parts of Point Loma, asking residents questions about density, population increases, whether high-rise buildings should be allowed, on whether they supported a building moratorium. Surveys were given to 8,500 households, and by the end, there was a return of 2,805 of those polled—a stunning and significant 33% return rate. When the City held public meetings on the Precise Plan during that fall, OB activists pushed back with a call for a “building moratorium” in Ocean Beach—a halt to construction until a plan that reflected the community was drawn up. The Committee to Save OB, an ally of the survey-takers, began to circulate petitions calling for a halt to construction and a moratorium on building. In conjunction with these efforts, OB’s alternative newspaper, the OB Rag, published salvos against the Plan and Pen, Inc., educating residents about the crisis, Pen, Inc.’s designs and members—and how they would be enriched if their plan went through. One special issue of the Rag was hand-distributed to several thousand households in the northern end of the community. Inside was a large “green OB” poster, a solidarity symbol against development. Soon, green OBs were popping up in windows and doors across the neighborhood. By early spring of 1972, the massive survey had been completed, and the results were presented to the community in a town hall meeting. Substantial and impressive, the results showed: 90.4% favored the small-town character of OB; 87.3% favored the building moratorium; 83.9% agreed with the use of down zoning to control population growth; 90% believed high-rise buildings should be prohibited and 60% felt apartments should be limited to two stories (this was before the 30-foot height limit); 75% wanted more neighborhood parks; and finally 88% wanted the results of the survey to play a major role in determining a community plan. The survey results validated the concerns of the activists, giving them a political mandate. They kept up the pressure; poll results were sent out to politicians at every level of government who represented the OB area; the petition drive for a building moratorium continued—and thousands of signatures were collected; a “Stop the Apartments” concert was organized at a local house on the cliffs—attended by 600 young people, many of whom signed the petition. The political pressure on City Hall appeared just too great. In May 1972 the City Planning Department announced that it had canceled or postponed all meetings or workshops on the Precise Plan. A collective sigh of relief swept over the community—for the planning and construction crisis seemed to have been averted, at least temporarily. Ocean Beach had awoken—its residents and small property owners having successfully mobilized in response to the threatened onslaught of development; meanwhile, the City and Pen, Inc. had backed off. The worst was over. Or so it seemed. The lull ended six to seven months later. To the astonishment of locals, the City declared it was making plans to push the same old Precise Plan before the San Diego Planning Commission for approval. During that same time, the City Council passed an ordinance authorizing the creation of “community planning groups” for identified neighborhoods of San Diego. Activists in OB jumped at the chance to be first in the city to exercise this initiative, and wanting no ambiguity, founded a new organization called the OB Community Planning Group (CPG). It was the 28th of February, 1973, when 80 people in the auditorium of the local elementary school formed the new group. Over the next few months and through a series of large, open meetings and democratic elections, the organization elected a permanent steering committee. Faced with this more formal opposition from a group even calling itself a “planning committee”—the City once again agreed to slow down the process and wait for input from the newly formed group. The push and pull maneuvering between one of the largest cities in the country and one of its smallest neighborhoods began again. True to form, the city countered the formation of the new grassroots group by announcing that it was going to bring all the different disparate elements together in something called the “Committee of 12.” The idea was to hammer out a planning document that everyone could support, so from July to September 1973, representatives from CPG—including this author—the Town Council, and Pen, Inc. gathered around tables in the local Recreation Center for weeks of discussions. Shepherded by city staff, the Committee reached consensus on a number of issues, and the city issued a brand new draft plan, called the “Draft Revised Precise Plan,” making it public in mid-January 1974. Activists were elated again, at least temporarily, as this was the first formal repudiation by the city of the old Precise Plan, the one drawn up exclusively by Pen, Inc. Gone were any plans for high-rises, or any indications of a planned “mini-Miami Beach”; off the table was any plan for whole-scale gentrification in northwest OB. The city had the Committee of 12 continue to meet well into 1974 in an effort to resolve a number of contentious issues, such as one-way streets (CPG opposed them), low-income housing (CPG supported it), and the key issue of democratic community-wide elections for a review panel to implement the new plan. A progressive voting bloc emerged in the Committee of 12 when CPG members and half the Town Council reps came to an agreement on a number of issues, including elections for a planning committee. They wanted to reach out to the community in order to achieve a wider consensus on the issues. But this endeavor was stalled by Pen, Inc. and the conservative town council representatives. And once again, the city tried to out-maneuver and water down this populist push by announcing it was expanding the Committee of 12 to 16 members by allowing a fourth group to enter the negotiation process, the OB Business and Property Owners Association. As the tale unfolds of how a small community resisted the pressures of the establishment, one key element remained at the core of the organization that led the political fight against the plans of Pen, Inc. and the city bureaucracy. The Community Planning Group, formed in early 1973, remained in the middle of the battle for the right to have a community plan reflective of the wishes of the residents. Central to this organization’s demands on the power structure was the concept of using democratic elections to form a planning committee with open voting by residents and property owners. Time and time again, the Community Planning Group fought for this type of community-wide election process. It was their persistence over a three-year period that paid off, as the group pressed for this new level of urban democracy. Part II will be published on November 14. I wish I had known 35 years ago, when I left Cardiff-by-the-Sea, because of over development, what I have read today. Perhaps I would never have left. Your grassroots involvement was sorely needed back then. Iam glad O.B. never gave up.